The native form of this personal name is galánthai herceg Esterházy Pál Antal. This article uses the Western name order. Prince Pál Antal Esterházy de Galántha (German: Paul Anton Esterházy von Galantha; 11 March 1786 – 21 May 1866) was a Hungarian prince, a member of the famous Esterházy family. He was the son of Prince Nikolaus II and succeeded his father on the latter's death in 1833. [In Hungary,] the feudal system still exists in all its ancient barbaric splendor. Prince Esterhazy, a Hungarian baron, is probably the richest man, who is not seated on a throne, in the world. He lives in the highest style of earthly grandeur. One of his four magnificent palaces contains three hundred and sixty rooms for guests, and a theater. His estates embrace one hundred and thirty villages, forty towns, and thirty-four castles. By the old feudal law, still undisturbed, he possesses unlimited power over his vassals, and can imprison, scourge, and slay at pleasure ... He has quite a little band of troops in his pay, and moves with military pomp and gorgeous retinue from palace to palace. Not long ago he visited England, and was a guest of the Lord of Holkham, one of the most wealthy proprietors of that island. While looking upon a very beautiful flock of two thousand sheep, the Lord of Holkham inquired if Esterhazy could show as fine a flock upon his estates. The wealthy baron smilingly replied, " My shepherds are more numerous than your sheep." This was literally true, for Esterhazy has two thousand five hundred shepherds. Despite his great wealth, Paul managed to spend beyond his means, getting into financial trouble just as his father had. According to the 1911 Encyclopædia Britannica, "the last years of his life were spent in comparative poverty and isolation, as even the Esterházy-Forchtenstein estates were unequal to the burden of supporting his fabulous extravagance and had to be placed in the hands of curators." His successor Nikolaus III got out of debt in part by selling the famous family art collection. While most of Paul's ancestors had served the Empire as military officers, Paul instead pursued a career in diplomacy, and later politics. After the Congress of Vienna (1815) he was appointed as ambassador to the United Kingdom. 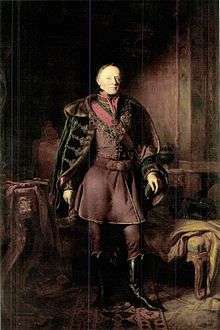 In 1842 he returned to Hungary and became a member of the Conservative Party, which supported the Habsburg supremacy and did not favour the reform experiments. On 7 April 1848 he was appointed as Minister besides the King in the first cabinet of Hungary which was controlled by Count Lajos Batthyány. His role was as the mediatory between Vienna and the Hungarian government. Seeing that his pacifying intentions ended in failure, he resigned from his position in September. Later Esterházy took connections with the immigrated politicians. He was Minister besides the King during the Hungarian Revolution of 1848. At the time of the Napoleonic Wars he worked for the Austrian Empire as a diplomat. He tried to form diplomatic associations for Vienna, (for example with the Kingdom of Saxony), but he did not achieve any results. Despite this failure Esterházy remained a famous and acknowledged politician.